Sawol-jawab—the interplay of questions and answers—is the foundation upon which much of Afghan music rests. With implications beyond the stage, this interplay posits that only the most thoughtfully constructed questions can elicit meaningful answers. Mahwash and the musicians of The Sakhi Ensemble test this belief in every performance. For their inaugural tour in fall 2012, artistic director Homayoun Sakhi has created an acoustically rich crossroad in which the musicians explore the interconnectedness of the seeker and sought, sacred and secular, traditional and contemporary. Afghanistan is a regional hub of cultural and social activity and is home to a vast array of musical genres. Principle among these is the ghazal, a traditional of folk songs with traditional melodies that speak to the human need for love, grace and transcendence. each of which warned her to sing for their cause or else face assassination. Her plight was recognized by United Nations High Commissioner for Refugees, and she was granted political asylum in the United States in 1992.
when music was controlled, censored, and finally, banned altogether, the classical rubâb style to which Sakhi had devoted his career not only survived but reached new creative heights. He was granted residency in the United States, and settled in Fremont, California, bringing with him the sophisticated and original rubâb style that he had developed. Fremont, a city of some 200,000 that lies southeast of San Francisco, claims the largest concentration of Afghans in the United States. There, Sakhi established himself as a leader of the local musical community, and received National and International acclaim for both his work as a performer, teacher and composer. From his base in Freemont, Sakha has sought out the finest available artists from Central Asia to accompany him in The Sakhi Ensemble (see below). Also, as a composer, he has created works for Kronos Quartet, Hannibal Lokumbe and the Berlin Philharmonic Orchestra. And he has collaborated with celebrated musicians from around the globe, most recently Ustad Farida Mahwash. Sakhi is now creating some of his most passionate compositions to date for and Mahwash and Voices of Afghanistan. The doyra is a roughly 2000-year-old instrument, originally played by women and used as an accompaniment to singing. Around 1950, men began to play doyra. The instrument became smaller, and the style and repertoire began to develop in new ways. But no prior player has come close to Kosimov’s innovations. Inspired by North Indian tabla players, Kosimov worked on his finger tapping technique, perfecting soft and hard strokes, and developing personalized rolls and slaps. He mastered rhythms in different time signatures—7/8 and 11/8 in addition to the usual 6/8. In 2008, Kosimov was asked to be a guest performer on one of Ustad Zakir Hussain’s Masters of Percussion tours in the. Homayoun Sakhi met Kosimov around this time. Kosimov’s facility with Afghan and Uzbek traditions, as well as North Indian classical music greatly impressed Sakhi. The two masters quickly formed a musical and personal connection and have performed together ever since. California—an area known to many as Little Kabul. There, Ustad Farida Mahwash invited him to work with her, and he joined The Sakhi Ensemble on harmonium. At the same time, Ragheb established and began hosting a new TV show “Sound and Image of Afghanistan,” which continues today. Ezmarrai Aref was born in Kabul, Afghanistan and began studying Afghan percussion from an early age, working with a number of masters over the years. He plays the tabla drum, best known for its use in north Indian classical (Hindustani) music, but also a mainstay in a variety of Afghan traditions. 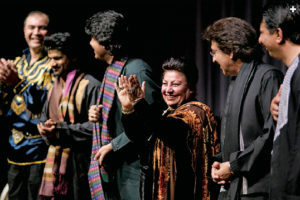 Since moving to the United States’s Little Kabul (Fremont, California), Aref has performed with numerous groups, including Ustad Farida Mahwash, The Sakhi Ensemble and, now, Voices of Afghanistan.